both movies and music. It's also space-saving with slim design, and can be hung on a wall or placed on top of a flat surface - look great either way. or other audio output devices. At Akixno, we provide 18-Month product warranty and 7x24 hours friendly customer service. 1. If no sound when connected with standard RCA cables, please kindly make sure whether RCA of your TV has audio output. 2. If no sound when connected with optical cable, please kindly set TV sound to PCM format. WHAT YOU NEED: Whether you enjoy relaxing in your spare time by listening to music or watching the latest tv shows or movies, you understand how important it is for the whole experience to have a proper sound quality. Now, we offer the perfect solution! DUAL CONNECTION: The AKIXNO sound bar gives you the choice to connect to your devices via Bluetooth connectivity for a totally wireless experience, or through different wired connections (optical, AUX, RCA) for an impeccable sound quality. The 4.0 Bluetooth advanced technology allows for easy pairing from a distance of up to 26 feet without obstacles! 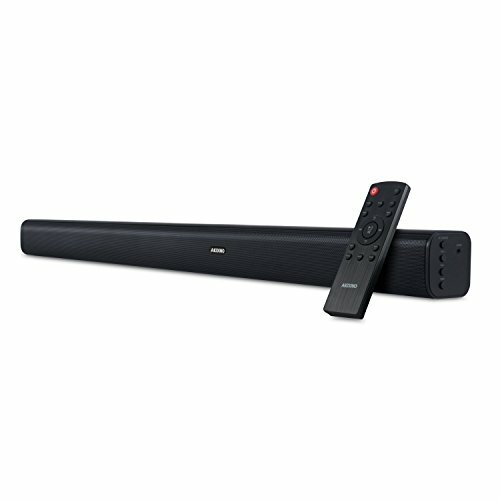 USER FRIENDLY SETUP AND CONTROL: This premium quality sound bar comes with a dedicated remote control which will allow you to adjust its settings, turn it on/off and change its modes with the simple press of a button. The sound bar also has built-in sound buttons and different led colours to indicate its current mode. ELEGANT AND PRACTICAL DESIGN: The AKIXNO sound bar is made from premium quality ABS and stainless-steel finish, an elegant combination that will surely add a touch of class to any décor. You can easily mount it on the wall or simply flat on the cabinet, as the slick, modern design won't take up much of your space. STATE OF THE ART SOUND: With 4 * 10W powerful speaker drivers and a 2.0 Channel Bluetooth TV, this sound bar provides high quality sound for all your devices, including TV, tablets, PC, smartphone or gaming devices. Unlike similar products on the market, this sound bar has no stand-by mode, allowing for an uninterrupted sound experience. If you have any questions about this product by Akixno, contact us by completing and submitting the form below. If you are looking for a specif part number, please include it with your message.